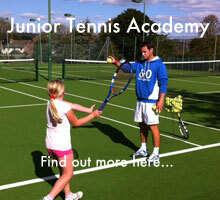 Children between 3 and 10 years old can now get stuck into the world of tennis with an exciting programme. With smaller courts, nets and rackets and lower bouncing balls Mini Tennis, offers the perfect introduction to the sport, with all the fun and energy of the real thing. There are four stages of Mini Tennis; Tots, Red, Orange and Green, each with their own court size and type of ball. This tailored approach enables players to develop vital skills and techniques at an early age. Many sports have a mini version including, football, rugby and cricket which are helping to develop young talent in appropriate learning environments. When players are ready to move onto yellow ball, full court tennis there is 4 options for them; 5 star, Grand Slam, Jr pro performance and Pro performance. These groups are designed for the 11+ age group. It is best to have a coach assessment to decide which group is best for you. All non-members who pay & play must pay an extra £1 non-members charge on the day which will go to the club, not the coaching.